The miniature GOST Mini-Ball camera is a standard analog camera included with all GOST Insight HD and GOST Watch HD Packages. This camera is the most discreet yet powerful security solution in the market. Measuring only 2.4 inches in diameter (61mm), this rugged mini camera will not detract from the décor or ambiance of the vessel. It has a great attractive white color housing to seamlessly blend in with the interior & exterior of the vessel. The marinized GOST Mini-Ball camera is tamper proof and water-resistant for interior or exterior mounting. The camera incorporates 540 TV lines in color for high resolution and a 3.6mm fixed lens for outstanding picture quality. A Day/ Night function automatically senses light changes and switches the camera mode from color in bright light to monochrome at night or in low light conditions, using state-of-the-art LED technology. 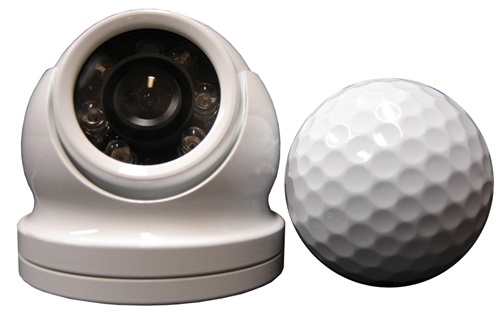 Despite its tiny size, the GOST Mini-Ball camera delivers exceptional security and surveillance monitoring. The GOST Mini Ball Camera is also available in reverse image (mirror image) to be used as a back up camera when aft view is not visible from helm, and in wide angle with a 2.8mm lens. These cameras are available in both video standards: NTSC (for most of the Americas) & PAL (for rest of the world).